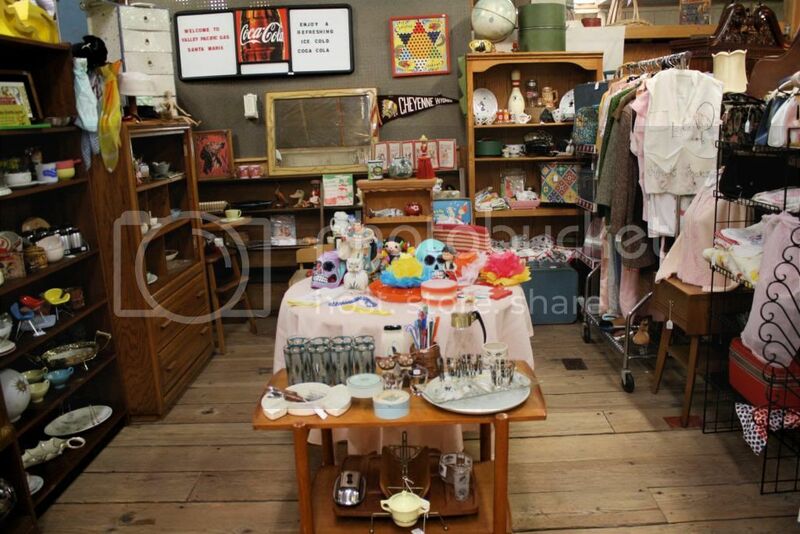 As I mentioned in my last post, Phillip and I recently decided to expand our antique selling venture and rent a second space at the Depot Mall. We spent all day moving in, and after hours of lifting, hauling, loading, unloading, arranging, and organizing, finally left happy, proud, and completely exhausted. 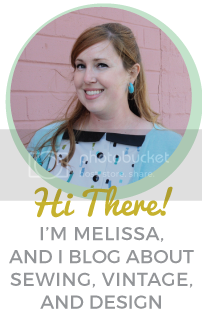 Here’s a tour of our two spaces. The new one is shown in the picture above. 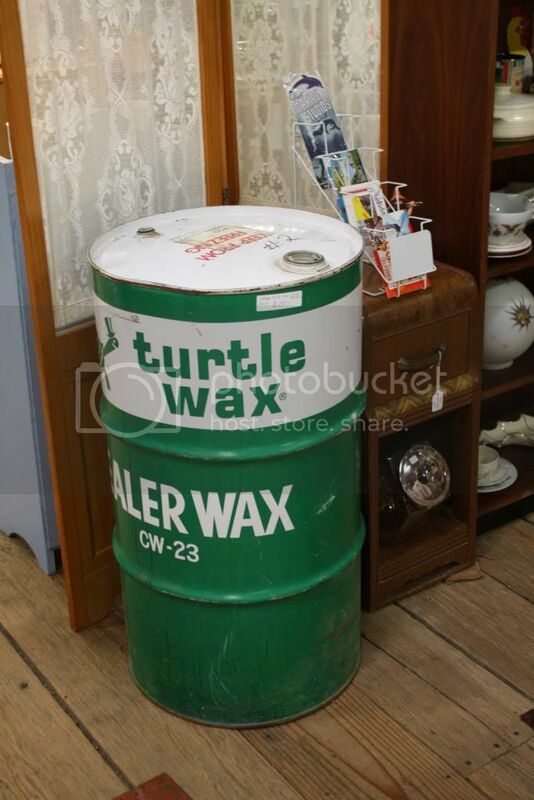 Here’s the Turtle Wax barrel we picked up at the estate sale last weekend. We have $250 on it- we’ll see how it does! I love switching things up and making the seasonal displays. This one is for Cinco de Mayo, of course. I think the tissue paper flowers I made and the last two masks left over from the craft fair add just the right touch. 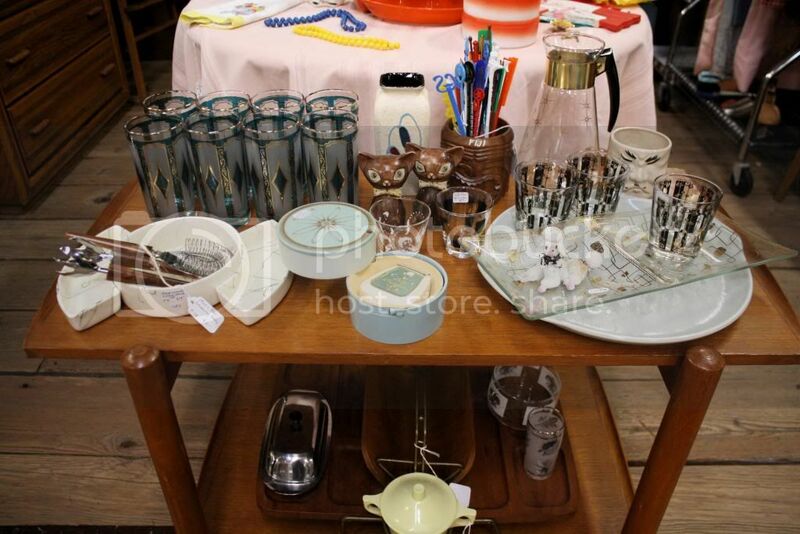 We brought the trusty bar cart out once again to load up with sixties barware. I love the way the new green and gold drinking glasses look on it! 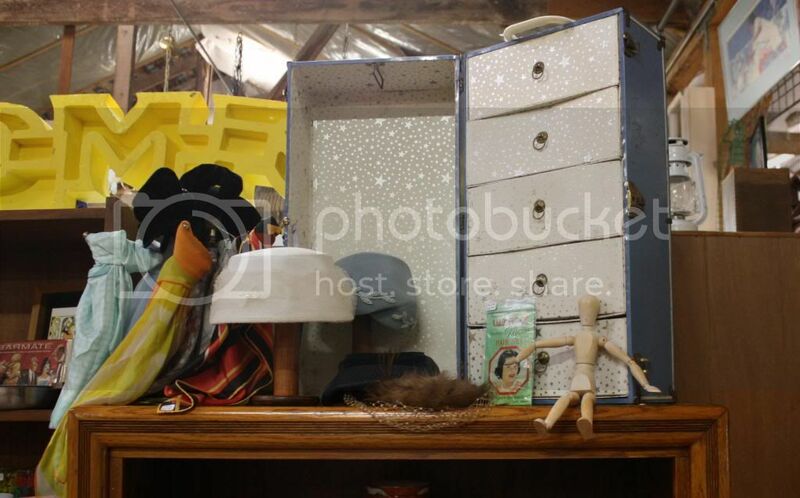 This light blue doll trunk was another estate sale find. I’m loving the silver star patterned interior! 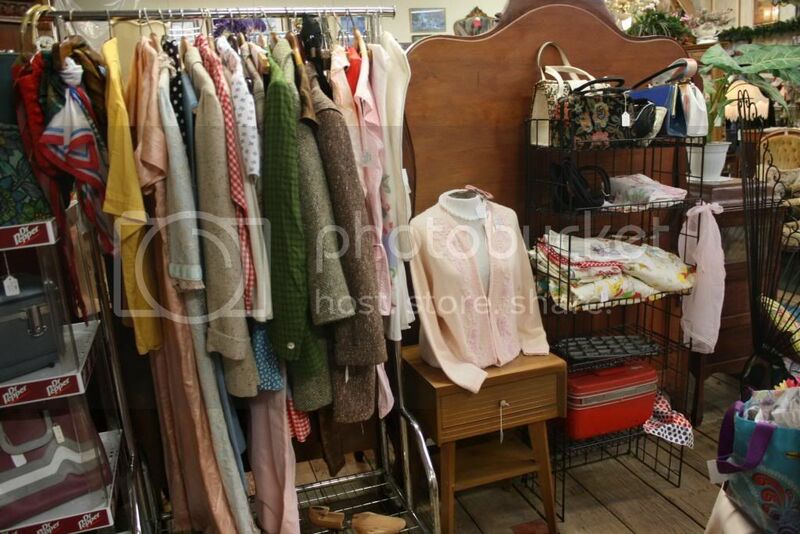 We’ve paired it with some of our silk scarves and vintage hats. Our Vegas-y display has been growing lately and getting too crowded for the shelf it was on, so we moved it onto a bigger shelf and made it more clearly visible from the aisle. 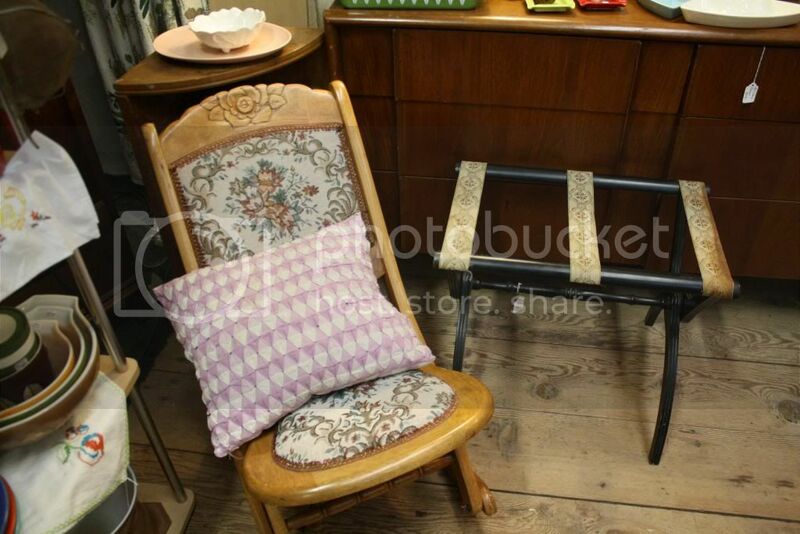 I made a small vintage sewing section. 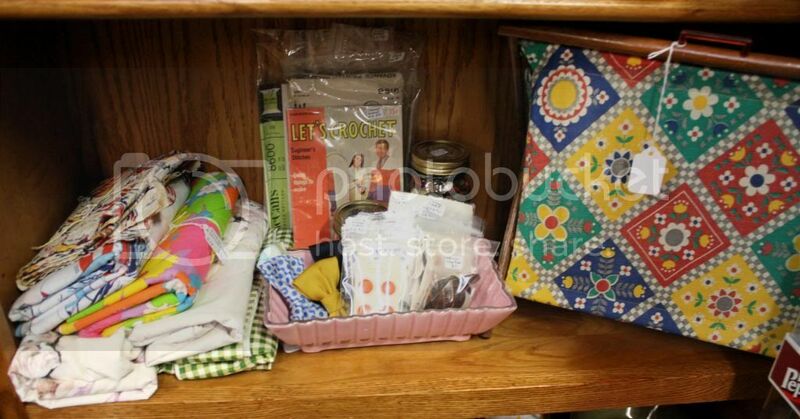 I’m not sure how many people there are out there like me who love vintage sewing supplies, but we shall see! I think one of the best moves we made was to bring the garment rack into the new space and make it more easily shop-able. It was in a corner in the other space and it was difficult to see everything clearly. Phillip’s dad gave us a couple of shelving units from the gas station he manages, which you can see in this picture. I’m loving the black wire one, which is just perfect for handbags and linens, but I’m not such a fan of the Dr. Pepper one. Someone buy that thing please! 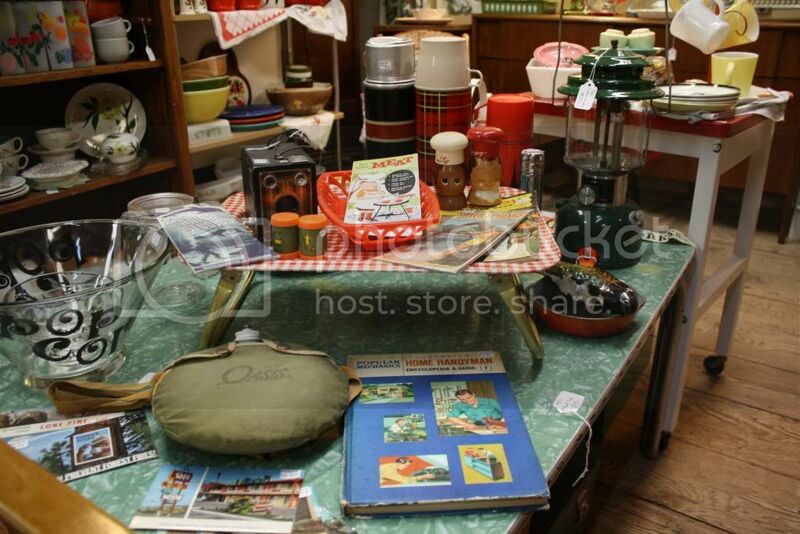 Moving on to our old space, we freshened it up with this new display- summertime, camping, and BBQ related items. I love making new displays! It really makes the place feel new and it helps less-noticed items get some attention. 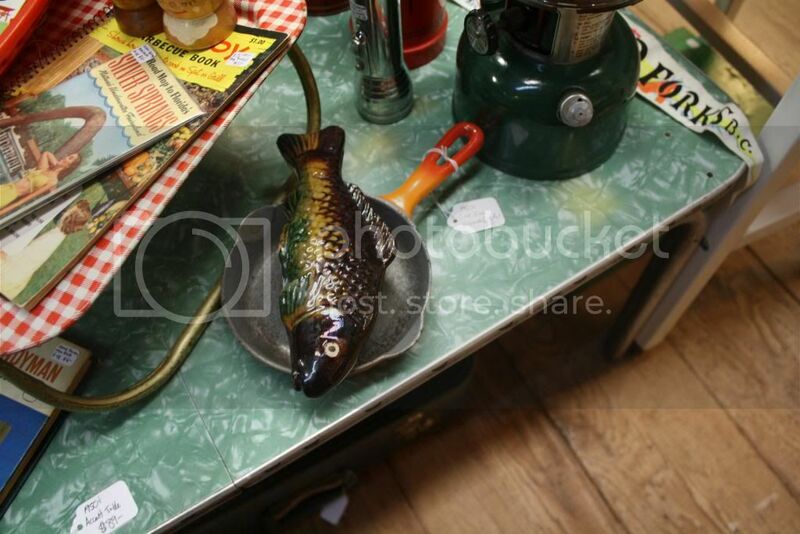 I laughed when Phillip stuck this ceramic fish in the frying pan. 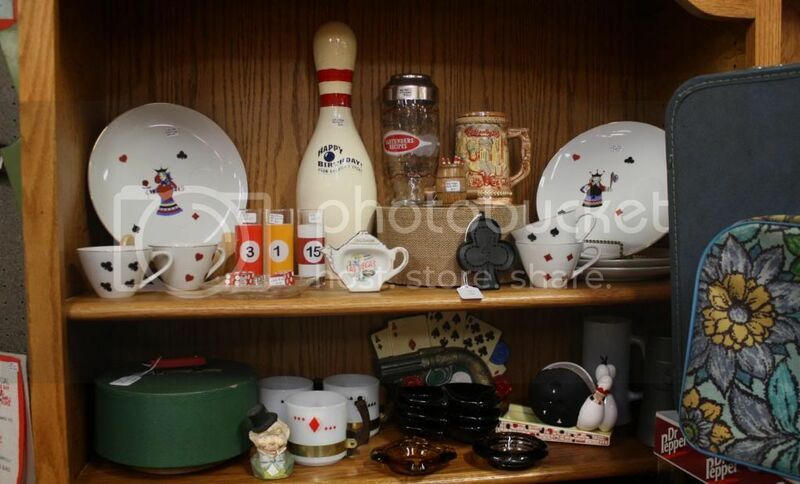 One awesome thing I’ve noticed is that once your friends and relatives know you sell in an antique shop they’re likely to give their old things to you! This wooden rocker was a donation from my aunt. Thanks Aunt Linda! Phillip bought this turn-of-the-century folding bed from an older lady we met through one of his classmates. 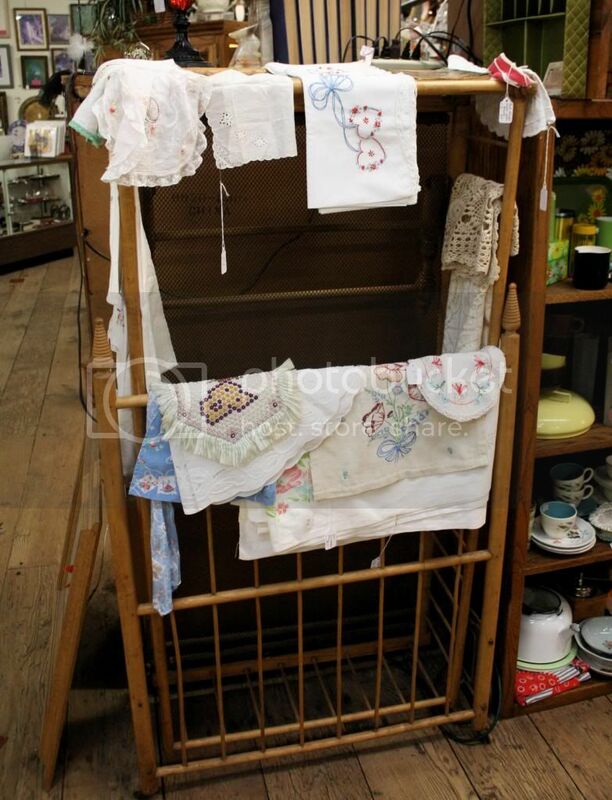 It has made a great rack for all of the linens! 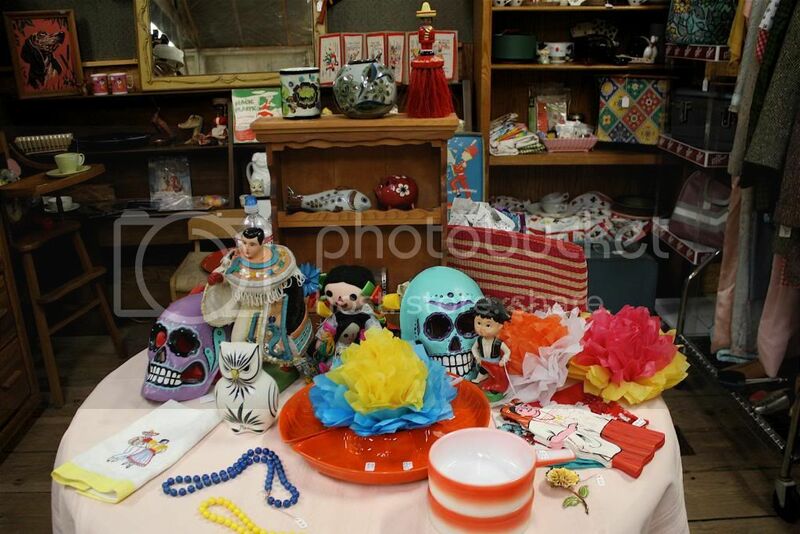 Hope you enjoyed this little peek into our antique spaces (plural)! We have been working really hard on this little venture and it’s been great to see it paying off little by little. We’re really looking forward to the summer and the tourist season and hoping that will be our busiest time yet! Do any of you fellow sellers have any input on that? I’d love to hear some tips!